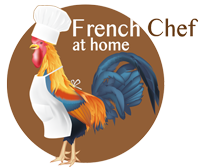 Many of our French Christmas traditions stretch back hundreds of years. We mark different celebrations throughout December and one such is the burning of a log from Christmas Yves until New Year’s Day. Originally, part of the log was used to make the wedge for a family’s plough to bring in good luck for the coming harvest. 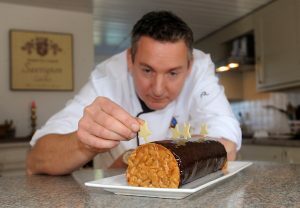 To celebrate this tradition and provide you with some festive fun with all the family, I’ve created this deliciously decadent Chocolate and Candied Orange Yule Log. Why not cook this on Christmas Yves with the family and enjoy with a glass of fizz and a cosy festive film to really get you in the Christmas spirit? Mix the icing sugar, hazelnuts and flour in a bowl. In a large and deep bowl, beat the whites to form soft peaks. When formed, add the caster sugar and keep on beating for 30 seconds. Then add the hazelnut mixture to the whites, mix gently with a spatula. Spread this mix on a large baking sheet (30 x 40 cm) and put it in oven for 15 minutes at 170°c. Heat the milk in a pan until it is simmering. Mix the egg yolk with the sugar. Add this mixture to the hot milk, heat the whole to 80°c stirring constantly with a spatula. Grate the chocolate and add it to the pan. When this mixture is warm, add the whipped cream and mix to obtain a chocolate mousse. Mix together the cream, the milk and the sugar in a pan and bring to the boil. Add the cocoa, with chocolate and soft gelatine. Allow to cool before applying to the log. Line the log mould with the biscuit, leaving 5cm of each side. Fill with chocolate mousse and spread the candied orange peel on it. Fold the side biscuit back over the mousse to close the log. Place a cooling tray on the mould and turn out the log onto it. Coat with slightly warm cocoa glazing. Chill again in the fridge for at least 30 minutes. Arrange Christmas decorations on top. With Halloween and Bonfire Night having been and gone, the festive period is now firmly upon us. 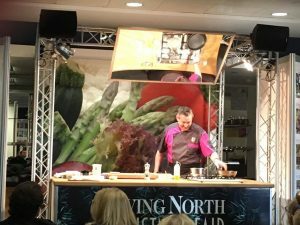 York Racecourse welcomed a cheerful crowd to the Living North Christmas Fair with a whole host of artisan producers, designers and retailers from around the region and beyond. 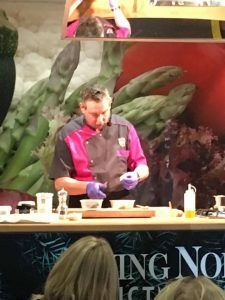 Yves showcased his traditional French festive dish of shellfish and wild mushroom vol-au-vent with a deliciously creamy Champagne Beurre Blanc. The demonstration area was packed with an enthusiastic crowd keen to learn some top tips and an alternative dish to create for the family during the festive period. Yves took the audience through his recipe before giving them a chance to taste the vol-au-vent. If you’re stuck for festive inspiration and would like to add a taste of France to your Christmas feast, you can try Yves’ recipe down below. Rinse the mushrooms with fresh water and drain them. Peel the shallot, chop and let it reduce in a sauce pan on low heat with 25cl of champagne. Once it has reduced by 2/3, turn off the heat. Put some olive oil in a frying pan, when the pan is hot enough, add the mushrooms. Allow them to cook until the water has completely evaporated and the mushrooms are golden brown. Add salt and pepper. Put the mushrooms in a heat proof dish and leave it aside. Turn on the heat under the sauce pan containing the shallot and champagne and add the cream. Let it cook for a minute or so and gradually add the butter in thirds. Whip the mixture and then add the last 10cl of champagne. Turn the heat down as low as possible. Put the vol-au-vent cases in the oven at 150°c with the mushrooms for ten minutes. Heat up a non-stick frying pan with olive oil and lightly fry the scallops and the king prawns for no more than a minute on each side. Drain off the excess oil by placing them on some kitchen roll. 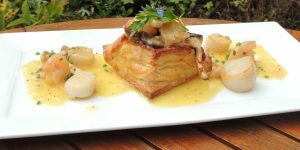 Set one vol-au-vent case on each plate, fill them with the mushrooms, add the scallops and king prawns on top and coat with the sauce. Add the chopped chives to garnish.